Our Science Products Rock! Discover with Dr. Cool makes unique, hands-on science kits that are fun and educational. Our best sellers include: Break Open Real Geodes where you get to crack open this natural phenomenon and discover the crystal treasure inside! In our Discover Amber Science Kit youﾒll polish 5 pieces of real Amber in search of the prehistoric bugs that may be trapped inside! 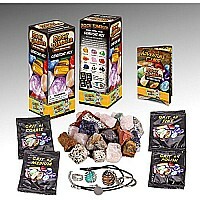 Whether you're studying fossils, making fluorescent rocks glow in different colors, or mining for gems with our spectacular digging kits, you'll love the hands-on nature of all our products. Dr. Cool kits contain the highest quality specimens, and each kit comes with a full-color adventure guides written by teachers. These guides are filled with interesting facts that will inspire any student! There's a lot to love about the Discover with Dr. Cool line of science products. In a nutshell--he rocks!